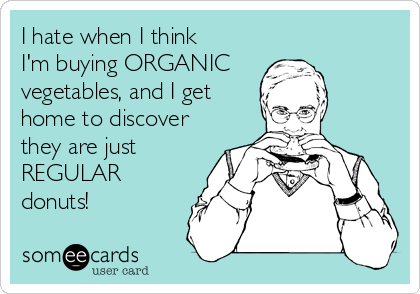 Organic Doublestuff – My blog about organic living, my unwavering devotion to junk food and my reconciliation of the two. Last fall I bought a 3 bin wire composter from gardener’s supply. www.gardenerssupply.com I love looking at their catalogs. I get as excited when they arrive as I did when the Sears Christmas Wish Book arrived when I was a kid. I decided on this one because I wanted it to be directly on the ground so the nearby struggling orange trees would benefit from the close proximity to the composter. I also liked the idea of having the 3 bins so that I could have compost at different stages. Even now, I still don’t know a whole lot about what I’m doing. I’m going by advice I’m getting from my mother in law who is a complete natural at all of this. I’m still trying to figure out the ratio of vegetable and fruit scraps to leaves, grass etc. My only problem I’m having is that I’m a little short to be able to use my little pitchfork to turn the compost in the bin. I think I’m going to have to start getting a little step ladder so I can get a little leverage. It was like Jack and the Beanstalk. I swear it grew overnight! I had no idea what this was. 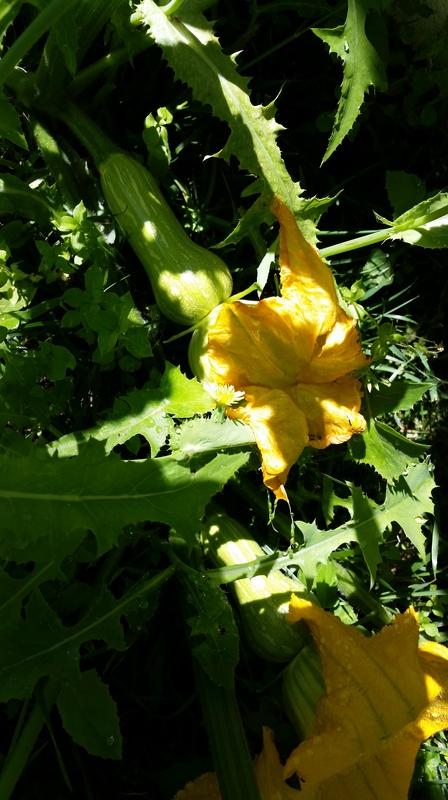 It looked like pumpkin or zucchini but I knew I hadn’t put any of that into the compost bin. 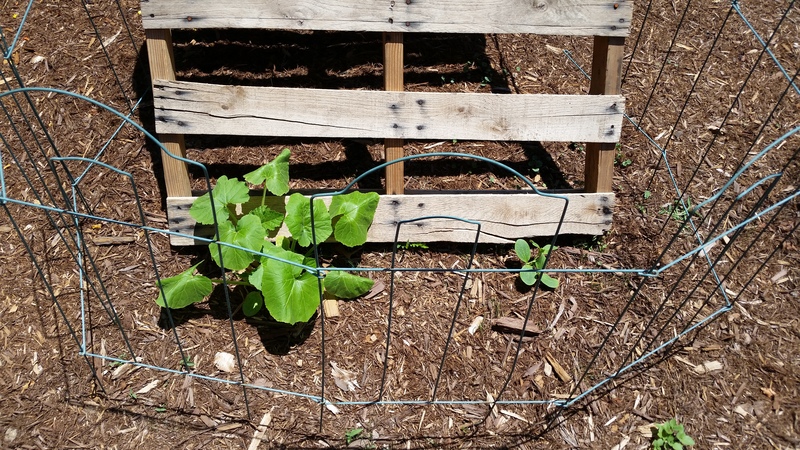 These vines were clearly coming out of the compost bins and as you can see…very healthy! The more I looked the more I was convinced that it was butternut squash and I had put the scraps of that in the compost in the fall. Sure enough, it’s butternut squash! There were a ton of blossoms! 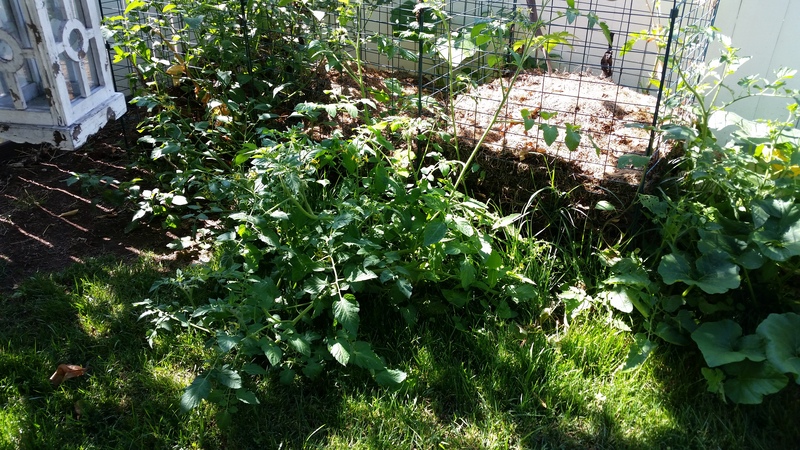 And tomatoes!….lots of them! As you can see, they are making it a bit hard to actually get to my compost bin. I kept thinking I may just have to cut some of this back so I can get to it but as of now I haven’t had the heart to. I’m really interested in seeing how these taste when they are grown from such a rich fertile place. 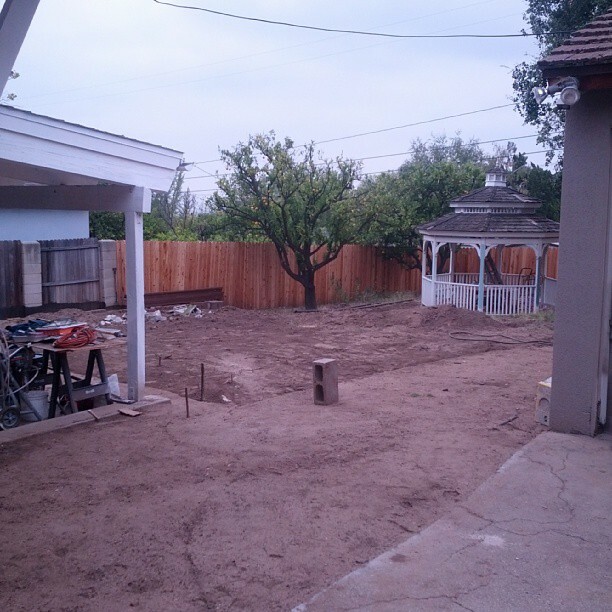 The front yard after the lawn was removed. I tried to repurpose some of the merchandisers that I had for my children’s clothing business to hang baskets of strawberries on. I also was able to reuse the pallets that my merchandise was shipped to me on. 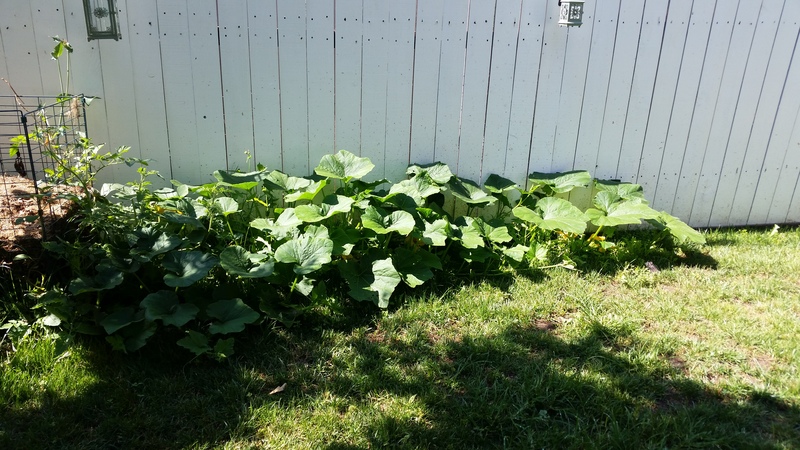 I love pumpkins and viney fruits and vegetables but they take over the yard and the fruit gets mucky from being on the moist ground. So, I put 2 pallets together to make an A- frame. I wasn’t sure how to attach them and decided I didn’t want to wait for my husband to get out the cordless drill so I just took ribbon and tied them together. I decided to start off with watermelon, cucumber, cantelope, and pumpkin on the 4 A-frames. I planted 3 different tomato plants in between the pallet A-frames. 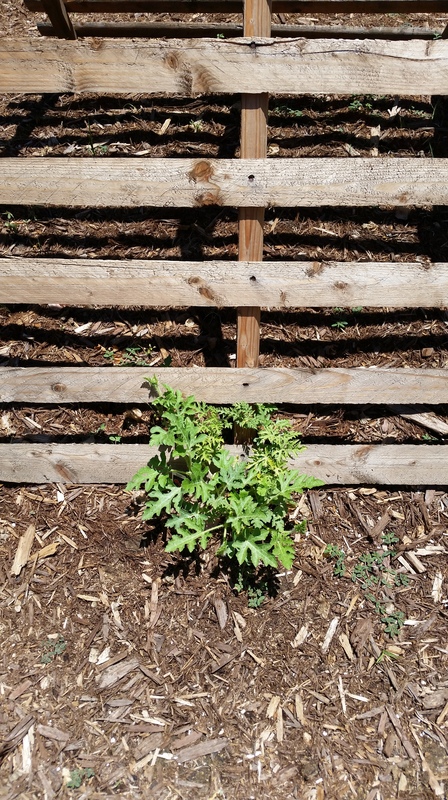 I did some reading about pairing plants together and planted marigolds around the tomatoes to ward off pests that prey on tomatoes and so far I haven’t seen a single leaf that has been nibbled on. My pumpkin babies. The disparity in size and the little fence is thanks to the deer. The deer won’t touch the pumpkins once they get bigger and very prickly but they loved the sprouts and pulled some right out. These are the only ones that I planted from seeds so I planted some more right away and kept them safe from the deer with the fence. Damn Deer! Everyone who drives by thinks there are so fun to see and slows down to take pictures and then get upset with me when I shoo them out of our yard. I’ll happily send them to their house to eat their garden! lol! The cucumbers took to their transplanting beautifully! 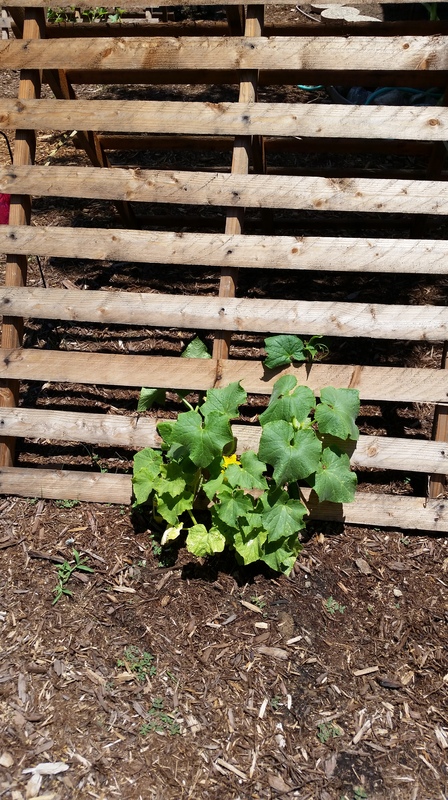 They started blossoming quickly and growing little tiny cucumbers right away! Cantelope…I love cantelope so much and I think this is the plant I’m most excited to see grow. I have made sure with all of the vines that I’ve planted two of them so cross pollination can occur. I’ve never made it this far with anything because I always forget to water. But, we still have the sprinklers in the front yard so these guys may have a chance. Very soon, we’re going to be converting the existing sprinkler system to a drip system and soaker hoses. The last of the “before” pictures before the wedding. The terracing is taking shape and it looks amazing! The fencing is going up to define each terrace. I never would have thought of this but it looks amazing! 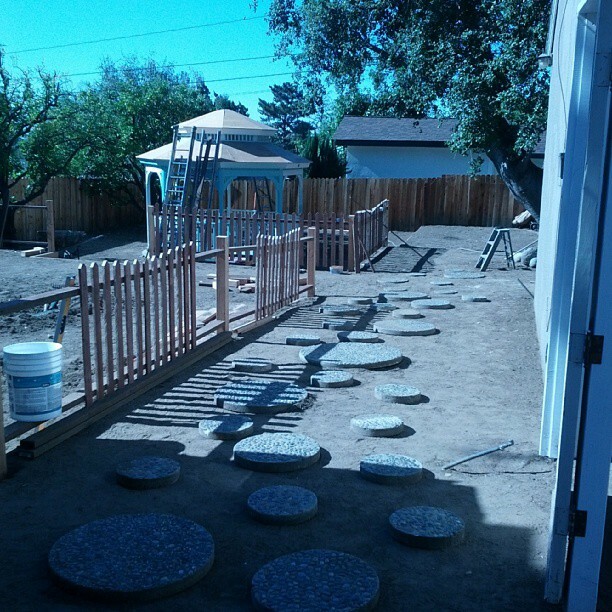 This fencing gave us different zones so each area can have a different purpose. We repurposed these stepping stones. My dad must have had an amazing love of stepping stones because they were everywhere in the yard, even places where you didn’t need a stepping stone. Stepping stones that led to nothing really. Positioning these took a bit of time. It was like trying to find the right place for the sofa….a little to the left…no…down and a little to the right…. 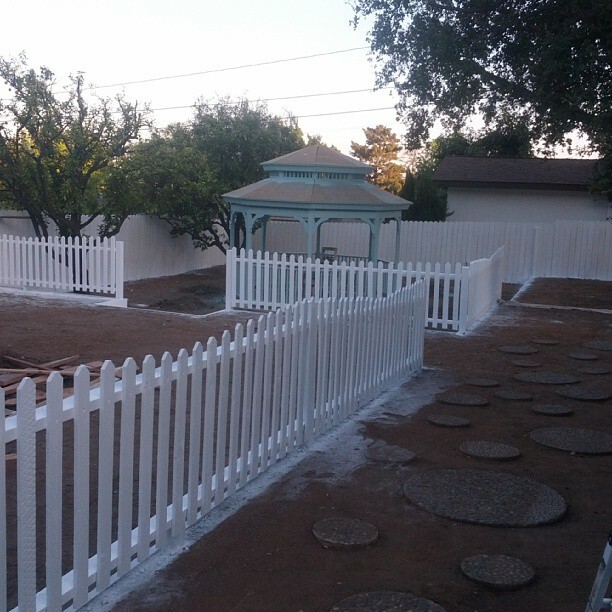 I love the crisp look of white trim and white fencing and I was not disappointed with the way it turned out. 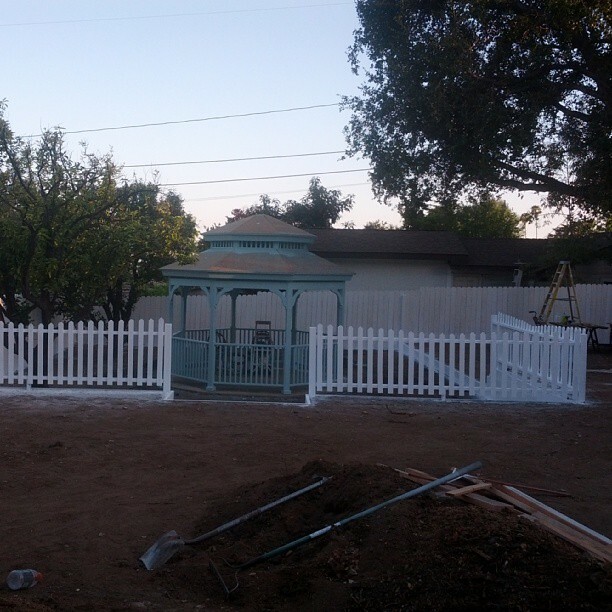 Tessa and I finally decided on a shade of paint for the gazebo. 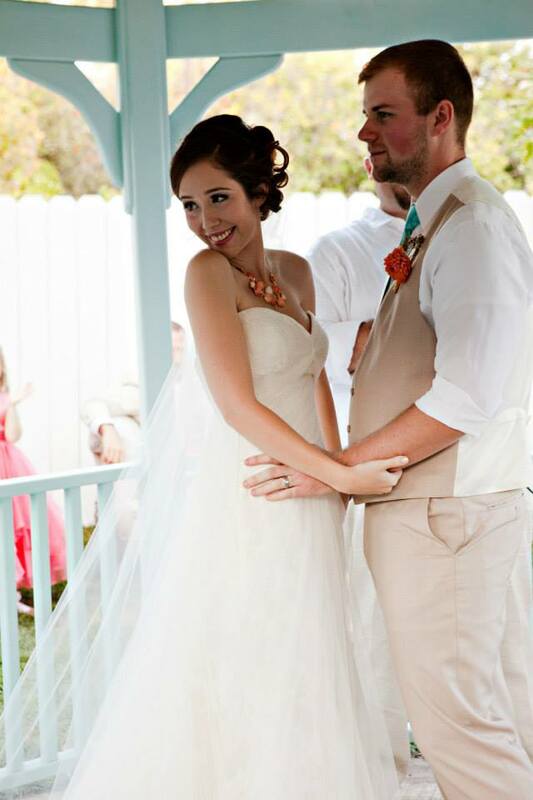 The colors of her wedding were turquoise and coral. 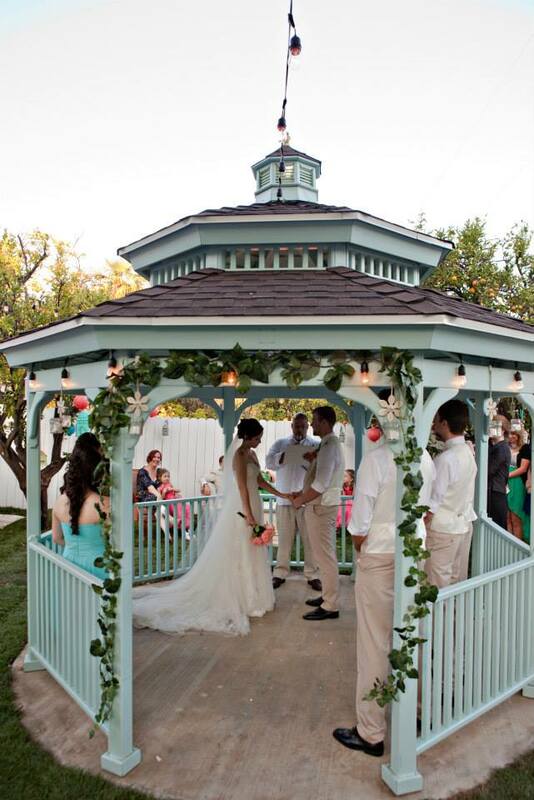 We decided early on that we wanted a shade of turquoise, a nice cool color for the gazebo. But, getting the right shade proved challenging because the samples we kept putting up made it look like Disneyland in the 60’s. We finally found this color which isn’t turquoise at all but had enough blue in it that it tied everything together. It worked perfectly! Definitely not a neutral but it allowed the turquoise and coral accents to really pop. Originally, we planned to completely strip the doors and paint them in shades of coral with touches of turquoise but we just ran out of time. When we showed one of the vendors they said they thought it was on purpose and was “shabby chic”. 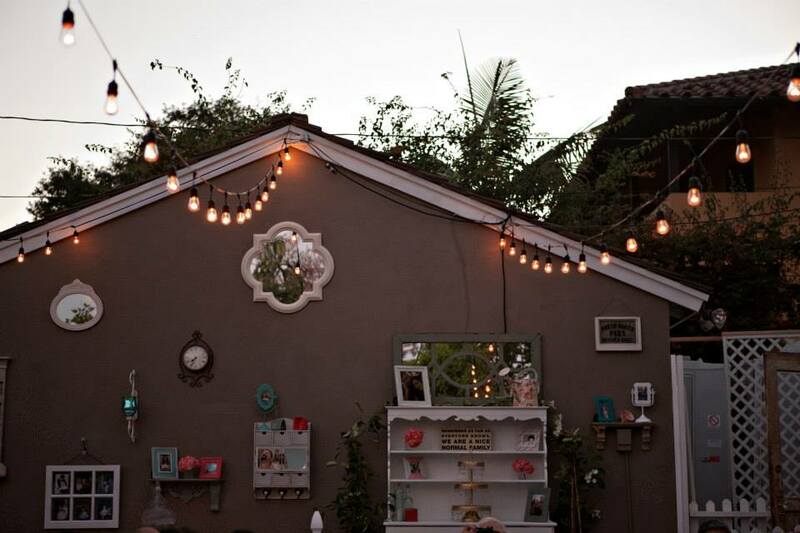 So, completely by mistake we created a shabby chic entrance to the back yard. There is nothing quite as transforming as going from dirt to green grass in a day. 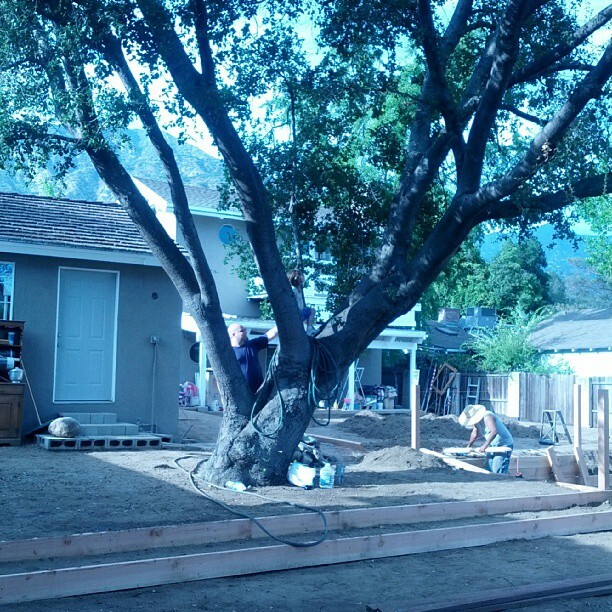 The sod was laid and it changed the whole back yard in an instant. I couldn’t stop looking at it. The grass has never been as green as it was when they laid they sod and it probably never will be but for that week it was amazing and beautiful! So, here we are a week before the wedding. I know, for any of you who know about laying sod you will know that this beautiful grass is not going to last because in a week we will have 125 people walking all over it. 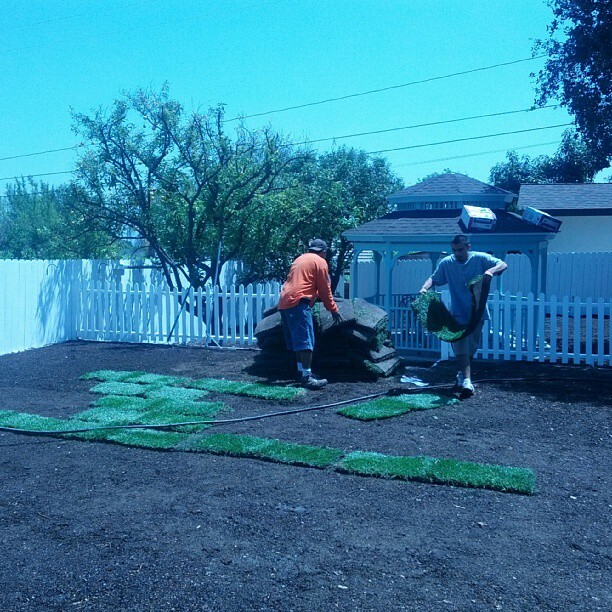 Sadly, the sod was laid down 2 weeks too late. 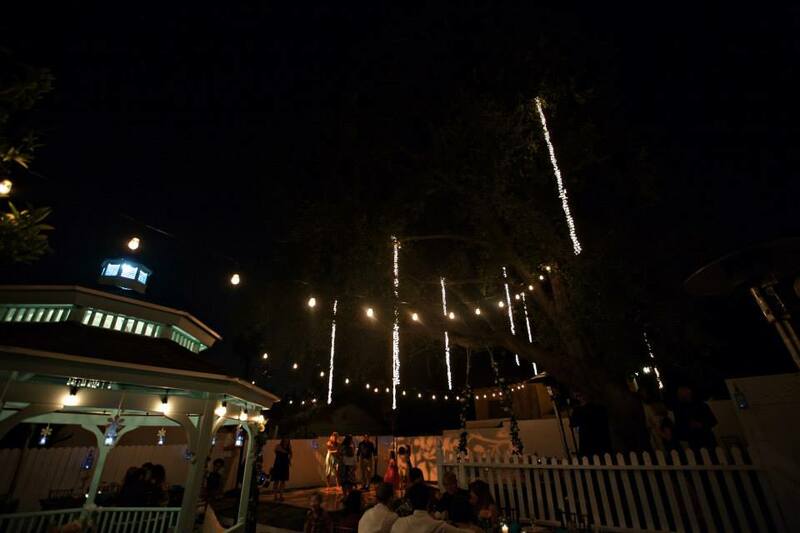 It hurts a bit to know that much of it died but to save myself from too much anguish I just call it a rental….a wedding rental like the chairs and the tables and then I only weep a little for my beautiful lawn that I had for such a short time. 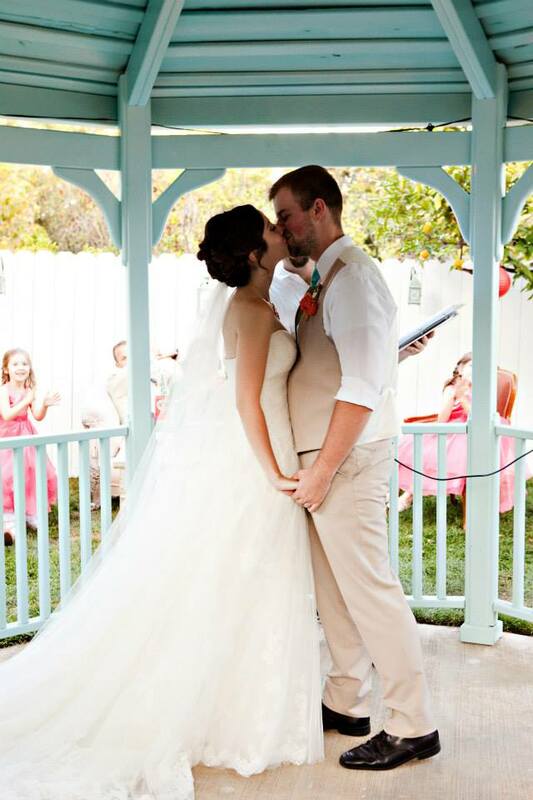 Next post will be the wedding! You can start to really see what the terracing is going to look like. I made tremendous changes to the house and now to the back yard. The whole time, in my head, I kept thinking…I hope my dad likes this. I know he’s gone and has been for awhile but I really hope if he can see what I’m doing that he likes what I’ve done to the house he built. I really think he would’ve loved the back yard. He was always so busy building the house and working full time that the yard got put on the back burner. He did take the time some time to work on the back yard and since he loved to share his knowledge with anyone who would listen…I got to learn a little bit about gardening. It’s not much but you can start to see the terracing take shape. Our lot is on quite a grade and you don’t really realize it until you start to look at it with a more critical eye. 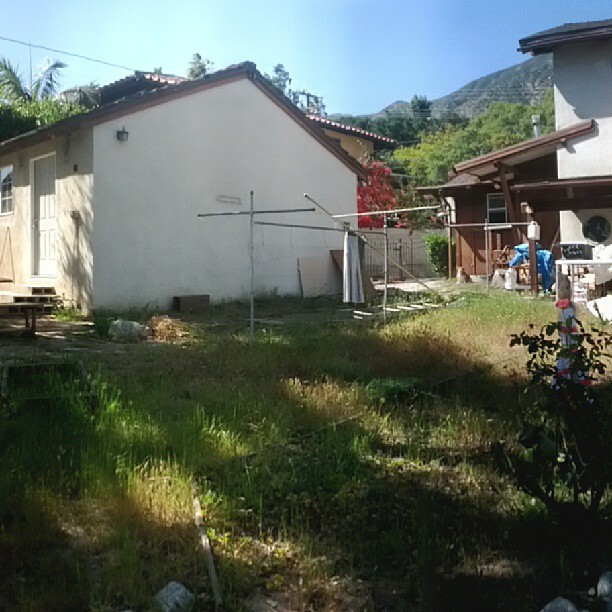 I suppose it was hard to tell anything with a slightly sloping back yard overrun with weeds. 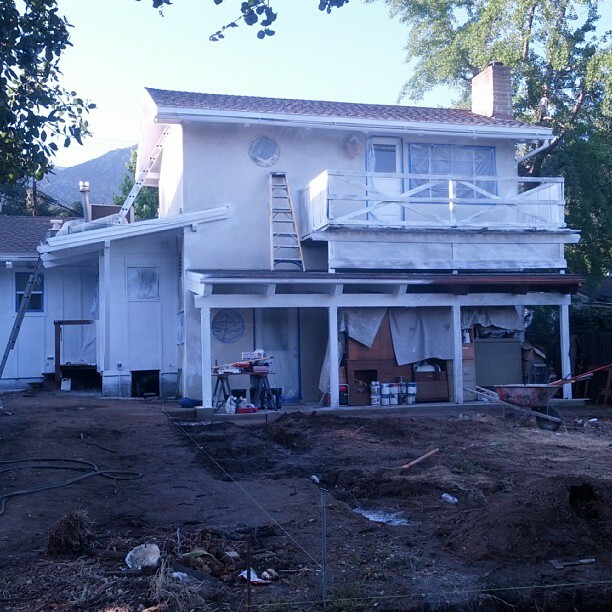 The front of the house starts to get it’s makeover also. 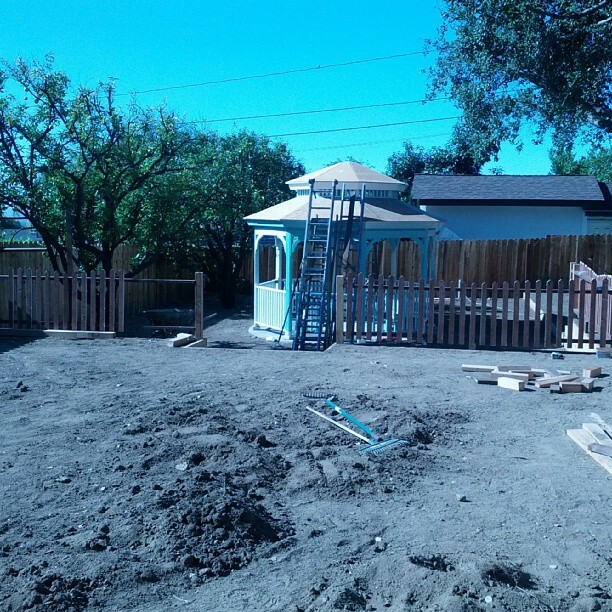 The gazebo doesn’t look so lost anymore. Finally it’s getting to be the focal point it should be. Over 20 years old and it’s still as solid as ever. Note to self…post a link to the company who made these! One of my favorite decisions I made for the back yard. The guys who were doing this thought I was more than a little crazy. 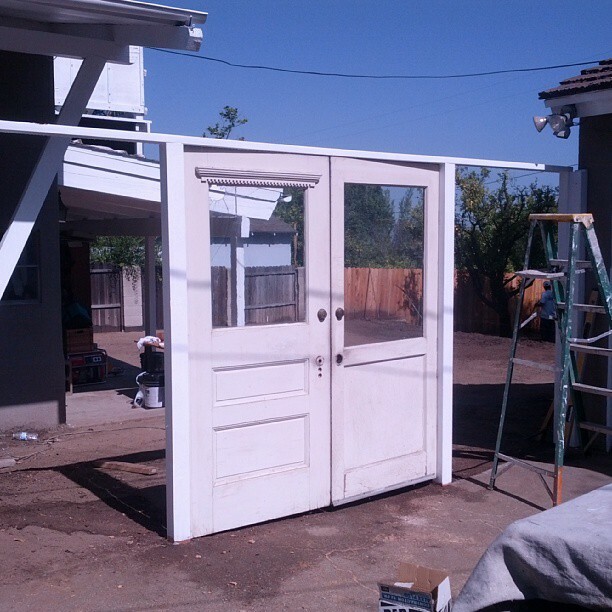 These 2 doors were salvaged doors that my dad had bought 30+ years ago from old homes they were tearing down. They’ve been in the house along with 2 fireplaces full of salvaged brick and windows. 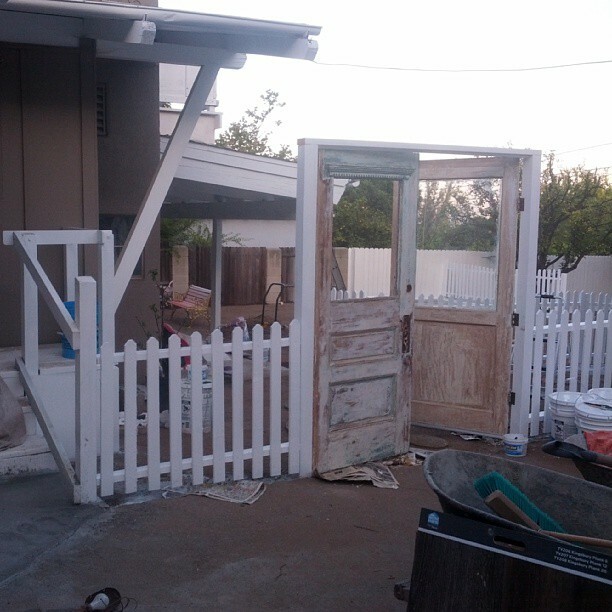 I love these doors and knew I wanted to keep them and do something with them. I originally had plans to use one in the front as an entrance to the rose garden but that plan was still off in the future. Part of the reason why they went here is because I had no place to store them. They ended up being the perfect entrance to the back yard and I had a little piece of my dad as part of the back yard he always wanted the time to spend in. Very, very blank….I wracked my brain with ideas to dress this up. The results were great and still ongoing! Not the best shot of one of the guys. Juan the Juanderful is one of the guys that made this all possible. He also had great ideas. 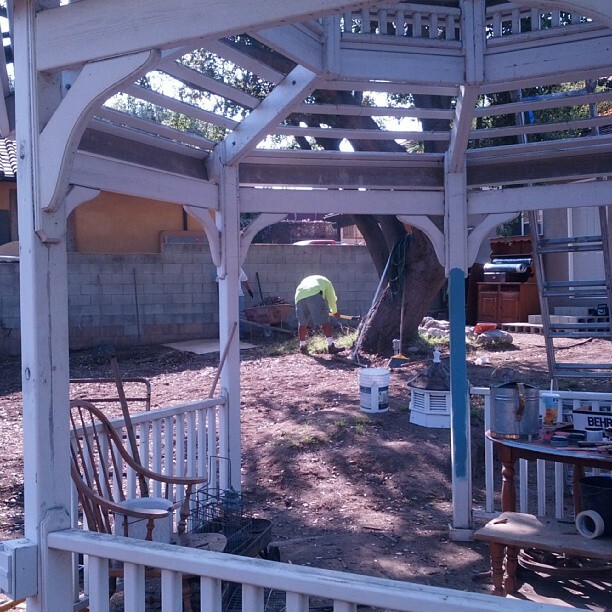 The gazebo became a pergola for awhile. Looking so much better. It is amazing how much a change in color can change your whole attitude about something. I know that I’m very sensitive to color. It completely affects my mood. 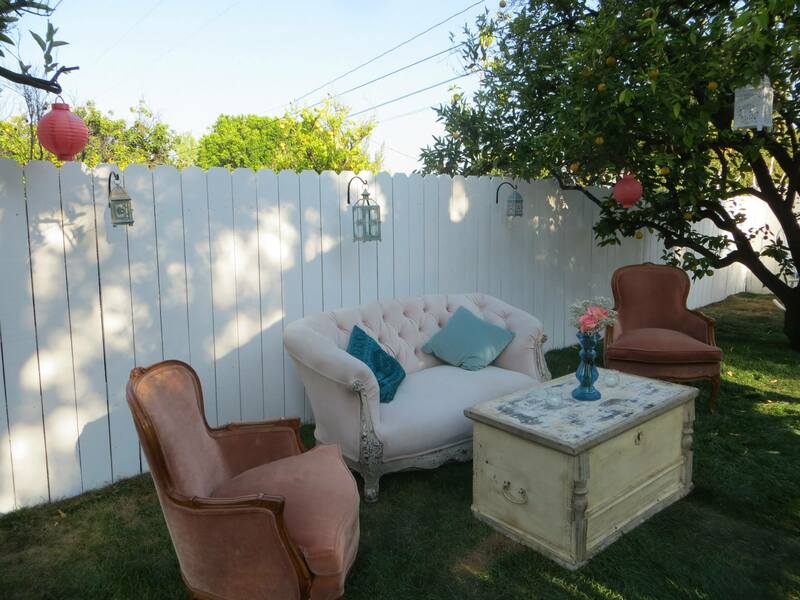 I went from absolutely hating being in this back yard to loving it with just a change in the paint color. I just love this picture of my girls. 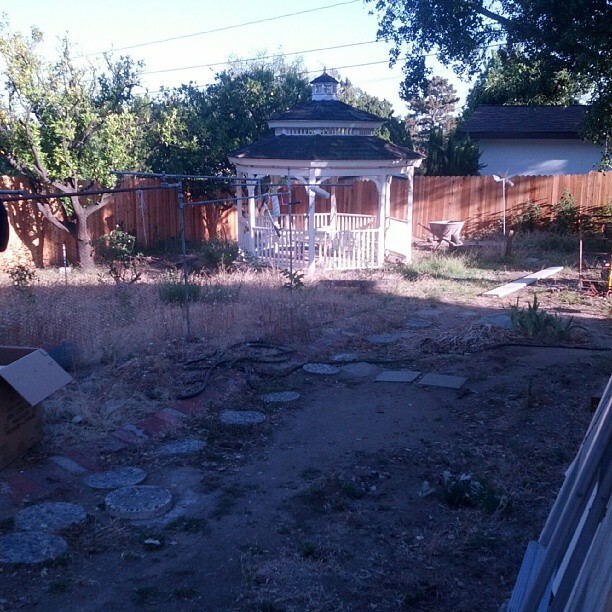 As promised yesterday…more before pictures of the wasteland that was our backyard. This was the uninspiring entrance to the back yard. Sitting here trying to figure out how to tag this. Ugly is the only word that comes to mind. As you can see our front yard didn’t look half bad. The paint job had definitely seen better days but it didn’t look as bad as the back of the house. 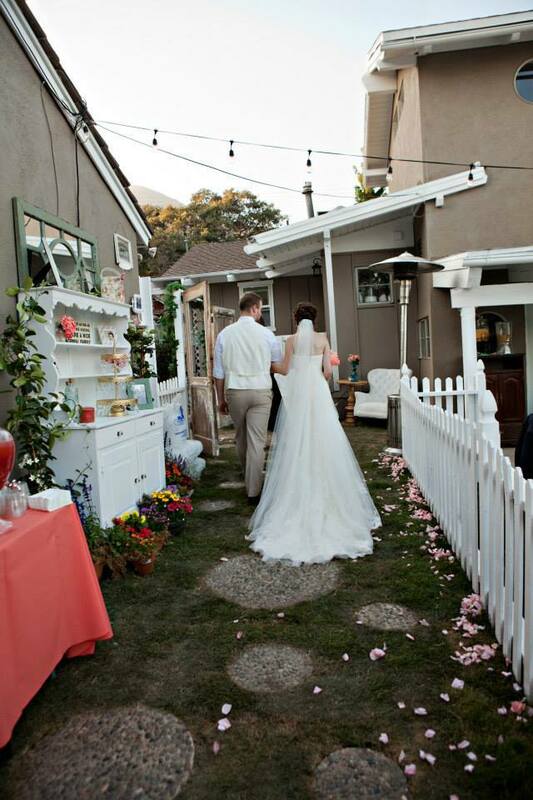 If it hadn’t been for the wedding I would’ve waited to paint the house but it was a great excuse to have it done. The terracing begins! I cannot tell you how exciting it was to watch this happen. Every evening we would all come out and marvel how amazing it looked each night. Imagine this….We thought this was amazing at the time! Primer is just primer but it was a beautiful change compared to what was there before. 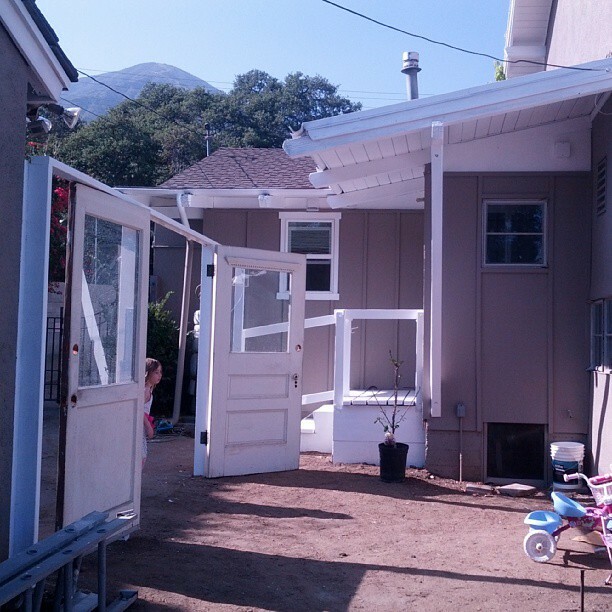 Just this little change made such a difference in the way the back yard felt…lighter and brighter and for me, happier. 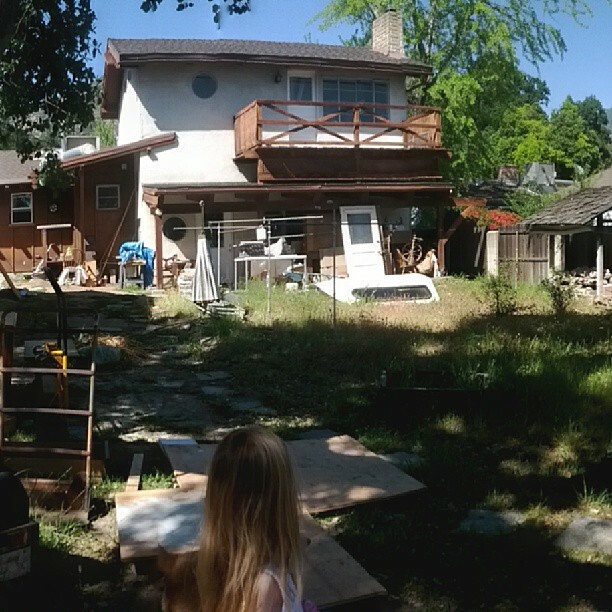 When we moved back into the house I grew up in to care for my elderly mother, not only was the house a wreck but so was the front and back yard. 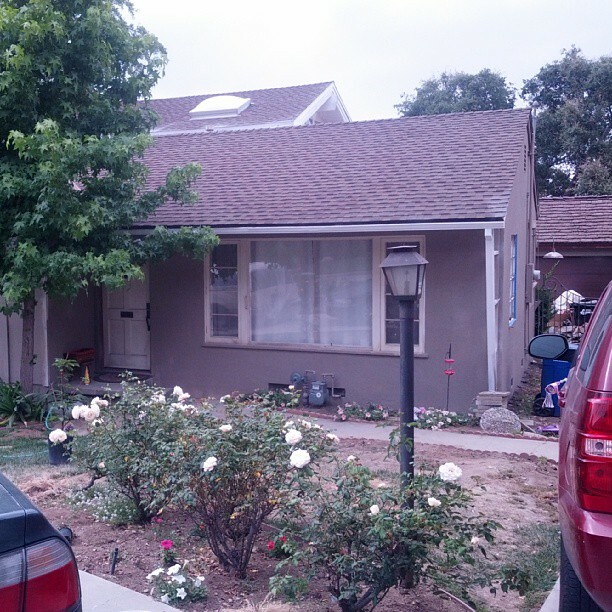 The front yard wasn’t terrible because the gardener tended to it a bit but he left the back yard completely untouched. Given all of the work and renovation we had to do just to make the house livable I just put the back yard on the back burner. As long as we had a clean house to live in I was satisfied. 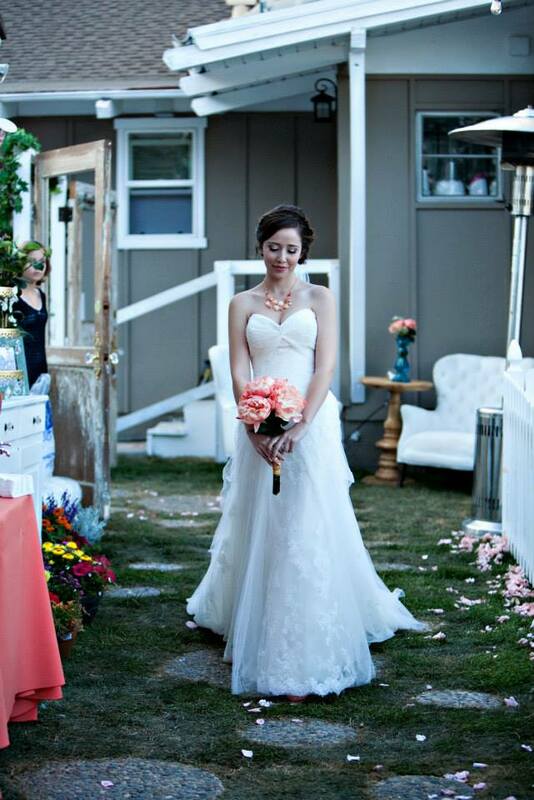 We were nearing the end of the renovation and everything was going to start quieting down when I mentioned to my newly engaged daughter that when the time came she and her fiance could get married in the back yard if they wanted. 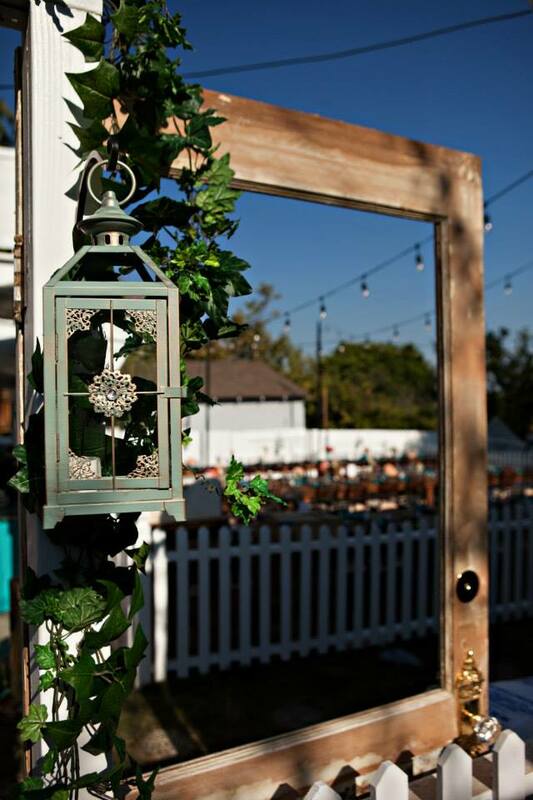 Long story short….this beautiful face is the reason why in 2 months we transformed a mess of a back yard into a beautiful outdoor wedding venue…. My future son in law is in the Navy and at least 6 months out of the year is deployed on a nuclear sub. Trying to plan a wedding when your fiance is in the military is next to impossible. However, he had 2 weeks off in 2 months time. 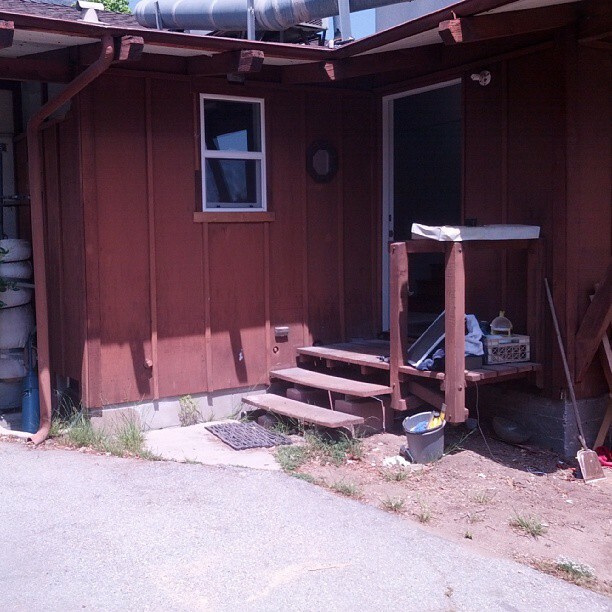 The following pictures are the before pictures of the back yard. 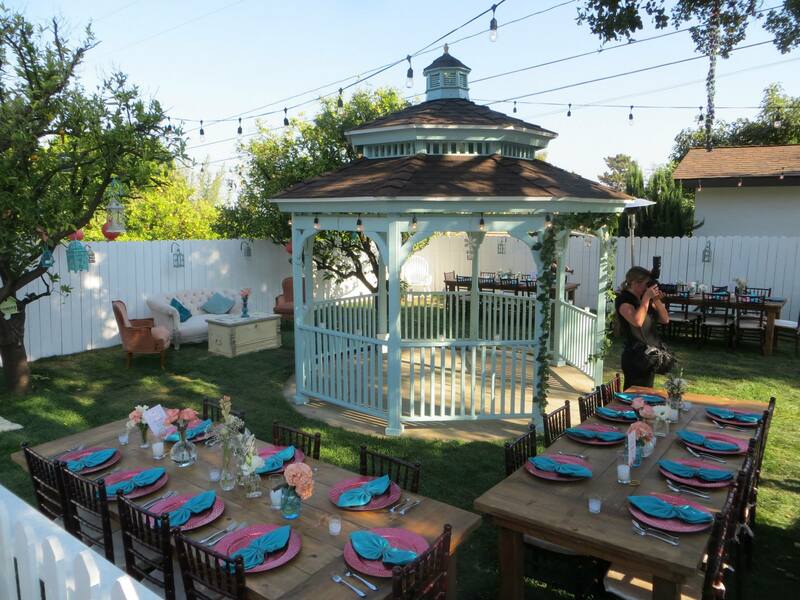 I really had no idea what I wanted the back yard to look like other than beautiful for my baby girl’s big day. My son in law’s uncle who had helped with the renovation came up with the terracing idea that we used and everyday I walk out in the back yard and water my fruit trees and look at the butternut squash growing I can’t believe how lucky I was to have him make all of this happen. I think the El Camino shell adds that extra special touch! I’m guessing that this back yard hadn’t seen any TLC in about 10 years. The only thing new in this picture is the fence I had put in very soon after the renovation started. 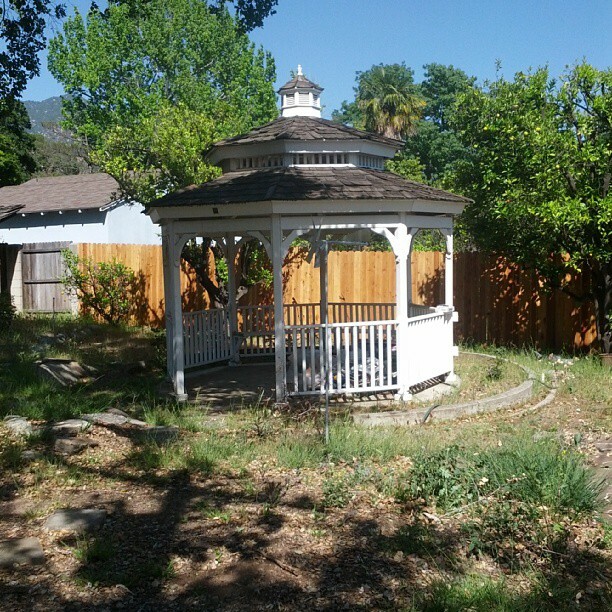 My mother’s gazebo…My dad had this built for my mom over 20 years ago. It was something she wanted so much and my dad would do just about anything to make my mom happy. 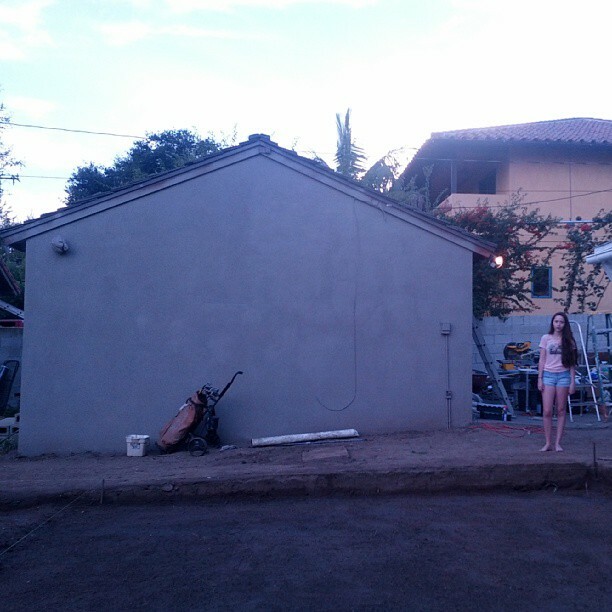 This used to be where our above ground pool was as you can see from the lovely concrete we used to have surrounding it. classy all the way! lol! 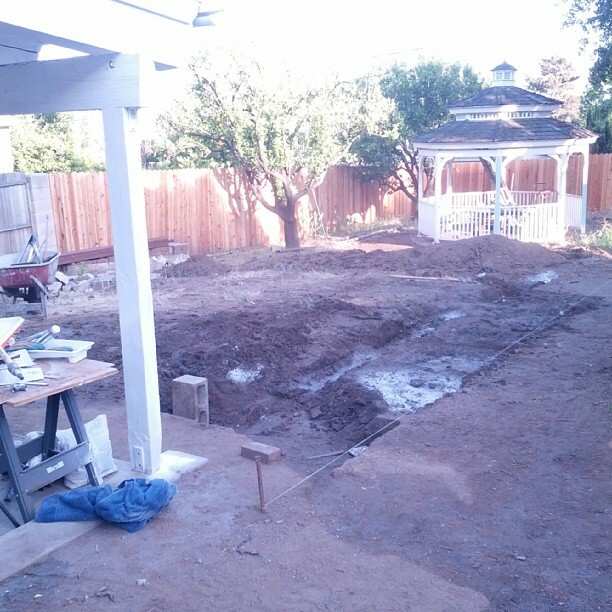 Tomorrow I’ll show the next phase in the progression of the back yard as it’s slowly transformed. 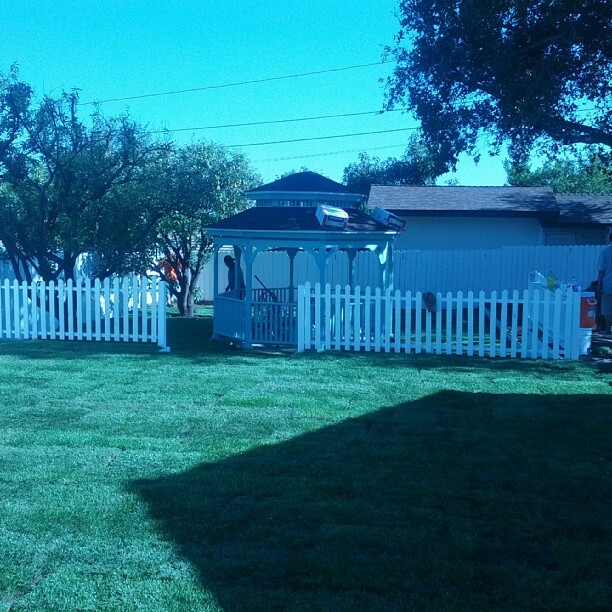 Believe me, you would never know the before pictures and the after pictures are the same yard. Just a quick post today…. You Should Start Your Own Blog! I think the first blog or entry is the hardest. You want to set the tone and tell everything all at once but you can’t. It would probably be 20 pages long and no one least of all myself would want to read it. My brain is so full of what I want to put down on this I feel like it’s going to explode. Now, I’m totally overwhelmed and really don’t know what direction I want to go. I’m going to start with why I decided to do this, what (as of now) I want to blog about and what my expectations are. I decided to do this because my husband said, “You should start your own blog!” Actually, there was more to it. We were taking a walk to my 5 year old’s new school….she starts kindergarten in August and we’re trying to get her used to the 5 block walk that she and I will take every morning. As we’re walking I keep looking at houses and yards and keep commenting on all of the things they could do to make it look so much nicer. I keep making suggestions which is when my husband says, “You should start your own blog!” hmmm…he may actually have something there. I started thinking about what I could blog about. 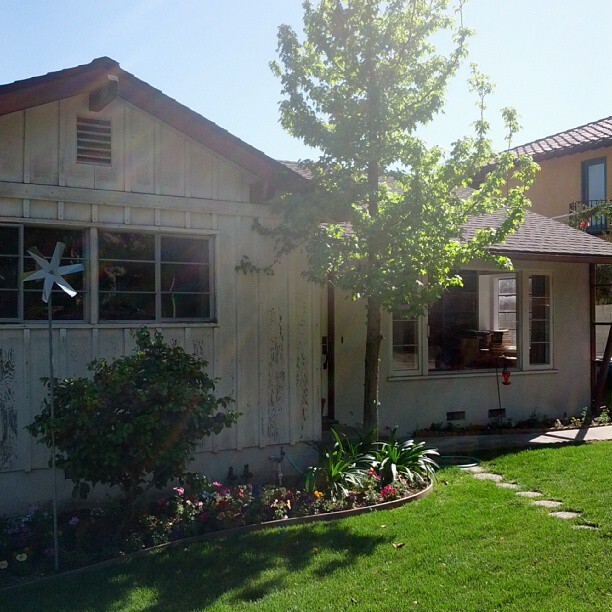 My family and I had just moved into my childhood home after discovering the extent of my mother’s dementia so I could care for her. To make this happen we had to make it livable so I devoted myself 24/7 renovating, cleaning, destinking, demolding, de everything the house so it could be lived in while trying to care for my mother. Once I got that done my thoughts turned to the back yard. 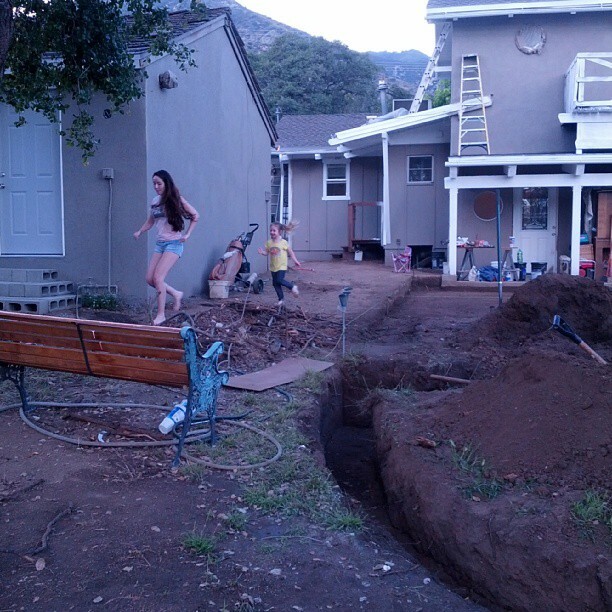 I now had a huge back yard and good sized front yard that I could do anything with. That’s the why of this blog. 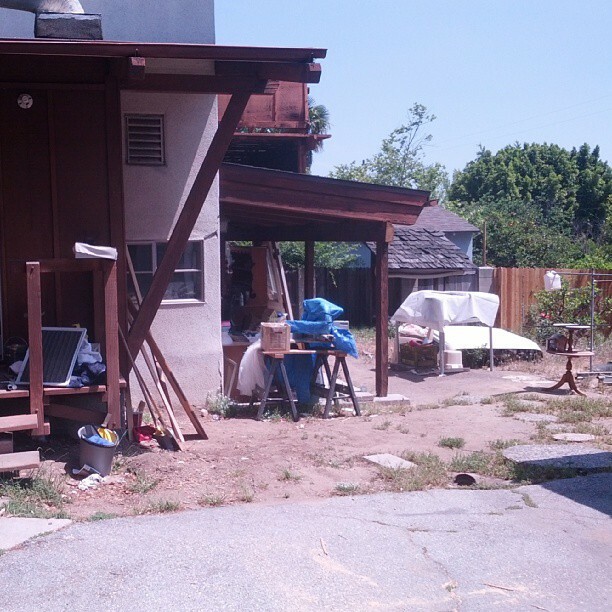 After doing all the things I’ve done to our front and back yards I started looking at other yards with an eye of someone who started out with one of those untended, unloved spaces. I’ve always loved the idea of gardening just never quite mastered the art of remembering to water after the fun of the first few weeks wore off. 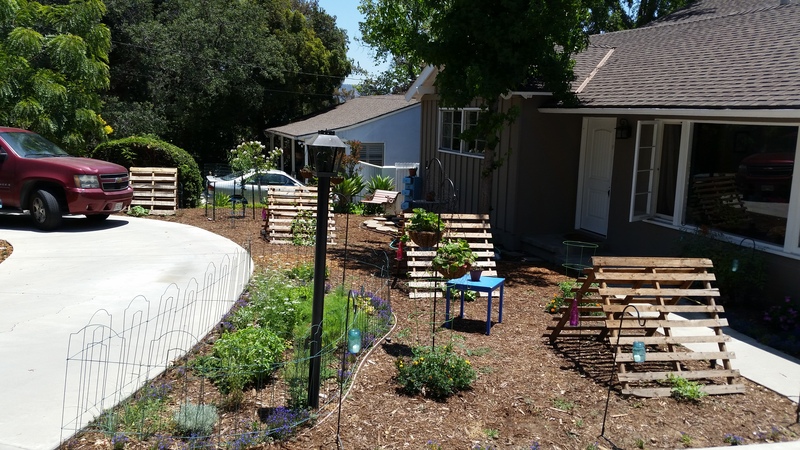 Pinning organic gardening ideas on Pinterest had become an obsession with me and now I had this awesome yard to do it in. So, here I am ready to jump in and become an urban organic gardening person complete with a whole yard full of fruit trees, vegetables bursting out of my Pinterest worthy planters, happy chickens laying eggs on my doorstep and I’m dreaming all of this while I’m licking all of the wonderful white stuff out of my 12th (whatever) double stuff oreo. I love those things! I love Beanie Weenies. I love Spaghetti O’s and meatballs and my most beloved beverage of all…an ice cold Coca Cola. I’m feeling a little hypocritical but I decide to ignore that and focus on my trying my hand at growing food for us! Too bad Armstrong , http://www.armstronggarden.com/, doesn’t have Cheetos trees…mmmm yum! 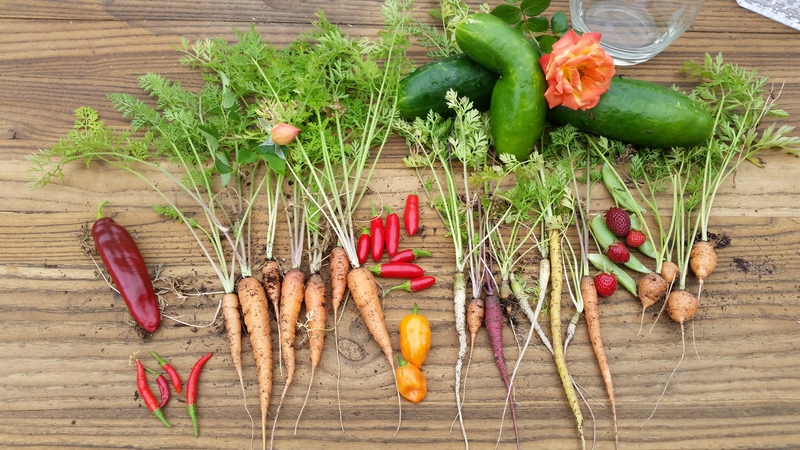 Feeding the world?…not quite yet.